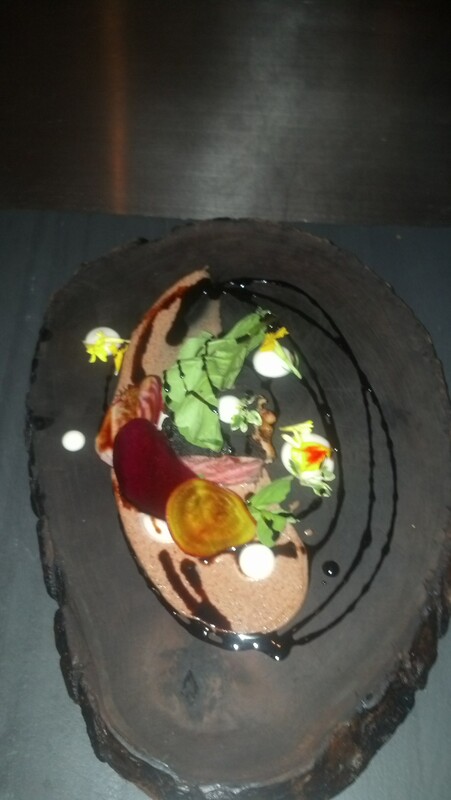 My good friends, Charlotte and Thomas, took me out for an amazing dining experiences last night. 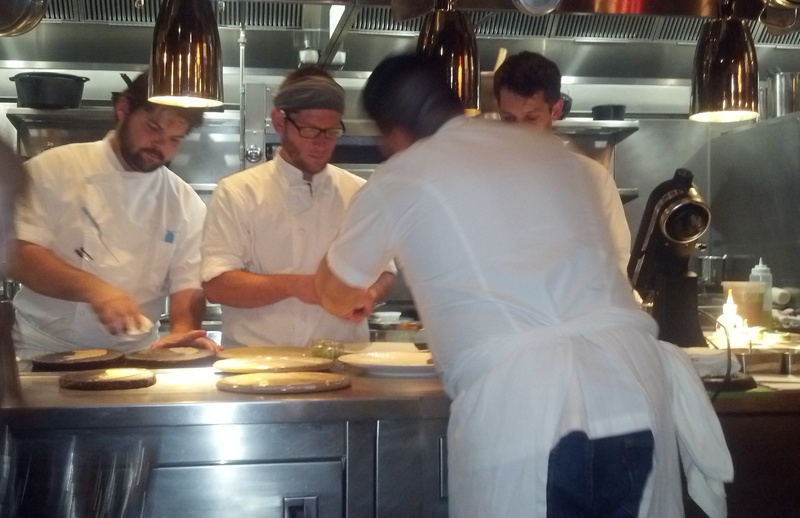 We went to Square Root and took our place at Chef Phillip Lopez’s table to experience their sixteen course tasting menu. That’s right, 16! and that doesn’t even include the lagniappe scallion beignet with a Chinese version of pimento cheese spread that I gobbled down before I could take a picture. We sat in awe and watched the culinary magic – his team wielding tweezers and operating interesting machines as they made the many plates of wonderful. I probably won’t do his descriptions of each offering justice but, suffice to say, my mouth had many orgasms over the course of the evening. 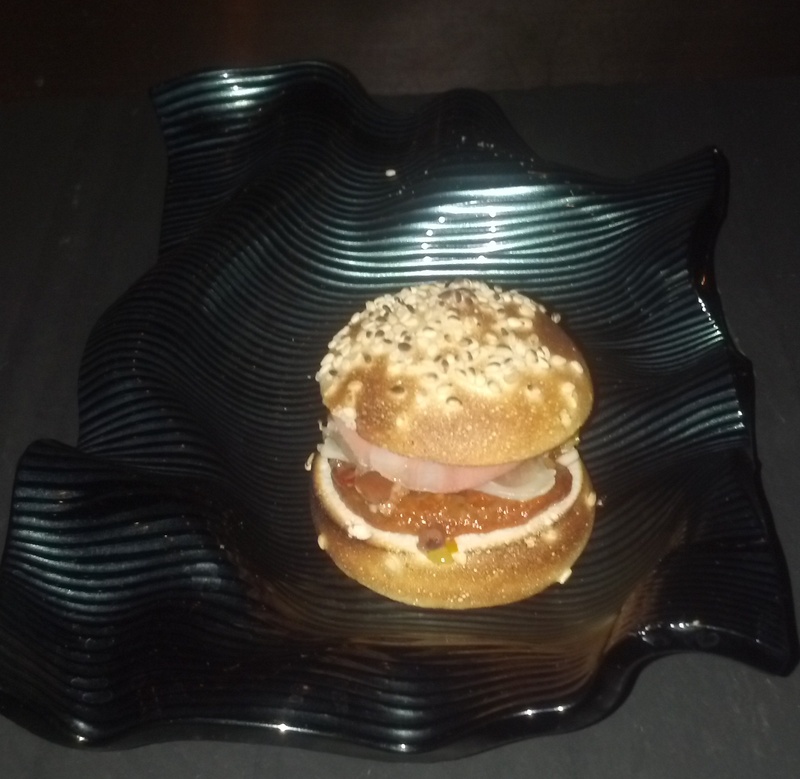 We started with a small cracker appetizer and that led to his version of a muffuletta. The ‘bun’ was made of meringue that just melted as you ate it and the tasty, meaty jam spread had us longing for at least one more bite. And another of the plate itself. The flavors were incredible and I couldn’t help but smile at the way it blew my mind. 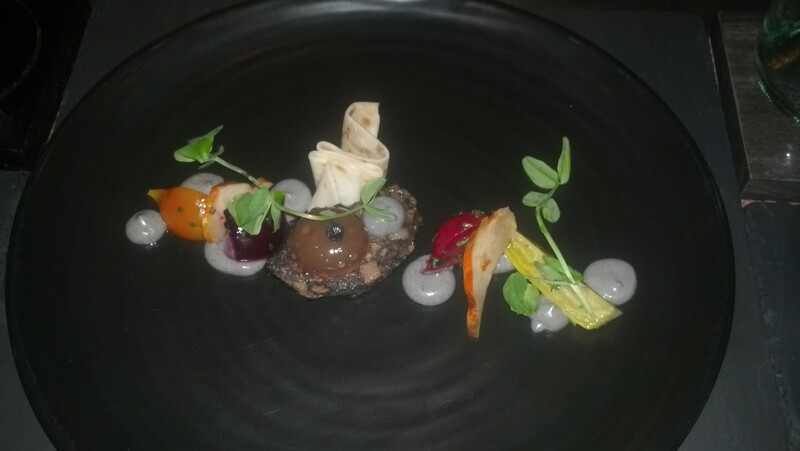 Next up was perhaps the only plate I wasn’t entirly a fan of – the oyster course. The cracker, the foam, the cream were all the essence of oysters. 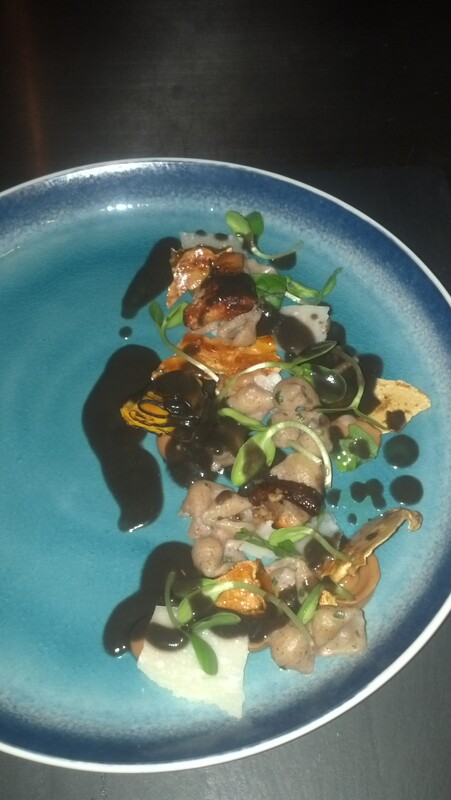 The next plate was lobster with forbidden rice. There was an Indian spice flair to this dish, which I’ve never had with lobster before but it was darn tasty. I was able to catch Chef Phillip explaining the difference in plate to Charlotte, who has a shellfish allergy, which they accommodated in some pretty imaginative ways. The next plate has us visiting his culinary homeland of Mexico with a bowl of menudo. 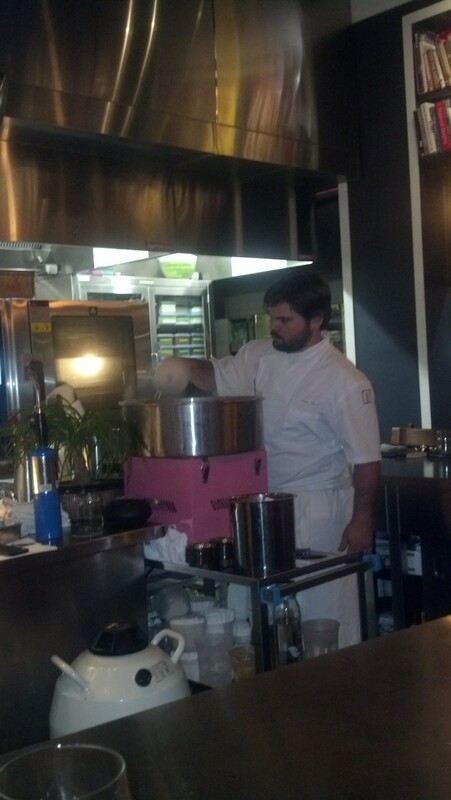 He started by distilling the broth at the table. 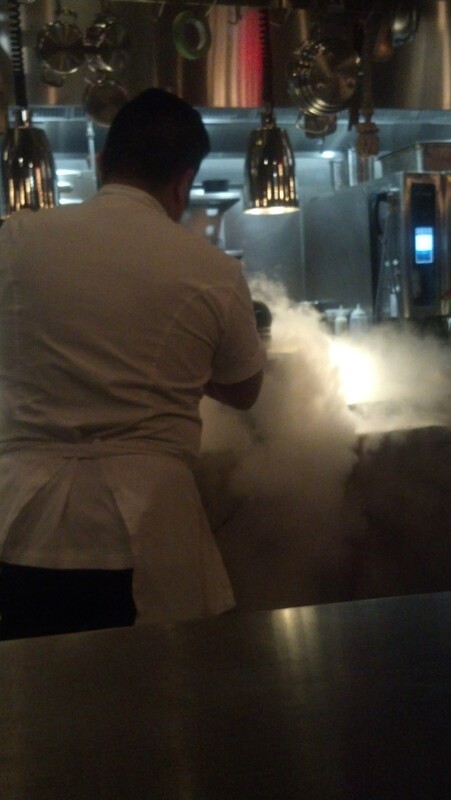 This was followed by breaking out the tank of liquid nitrogen to take lime wedges to the next level. They froze lime juice in the mixer and the frozen droplets were amazingly intense. 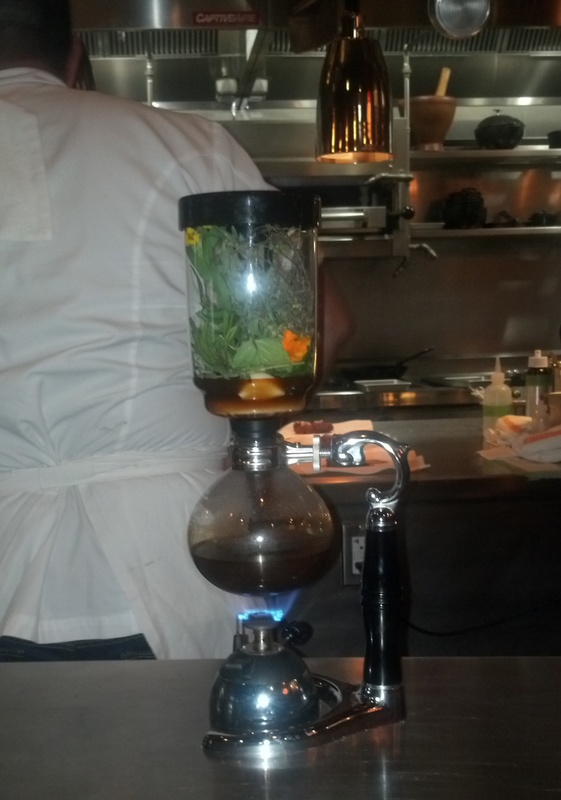 It was a fun to watch the witches brew as it was to taste. The bowl of menudo had all the flavors of this very comforting Mexican dish. 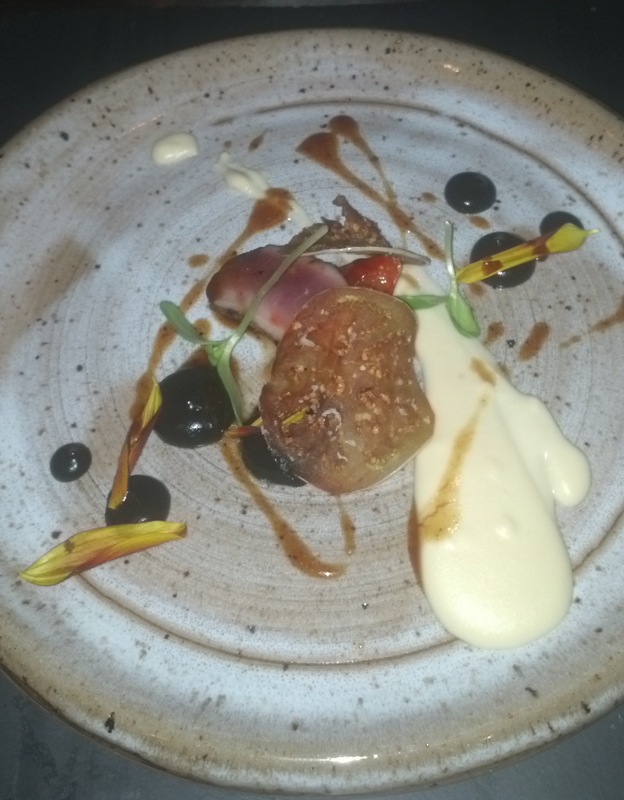 Next up was a blood sausage with beets and a peeled and lightly heated muscadine grape that broke when touched and released it juices over the plate. It was so good I ate all my vegetables. Pasta came next with a sauce made from a fungus found on corn and considered the truffle of Mexico. It was earthy and entirely unlike anything else I’ve ever tasted in my life but good enough that I broke down and ran my finger over the plate to get it all. 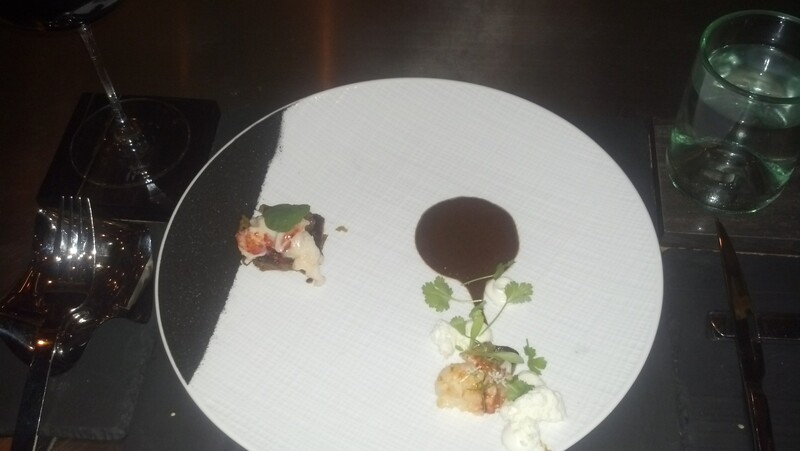 We then revisited lobster in an eclipse plate. The carbonized onion on the side was a little odd but the lobster was creamy and a delicious contrast to the deep, dark sauce. 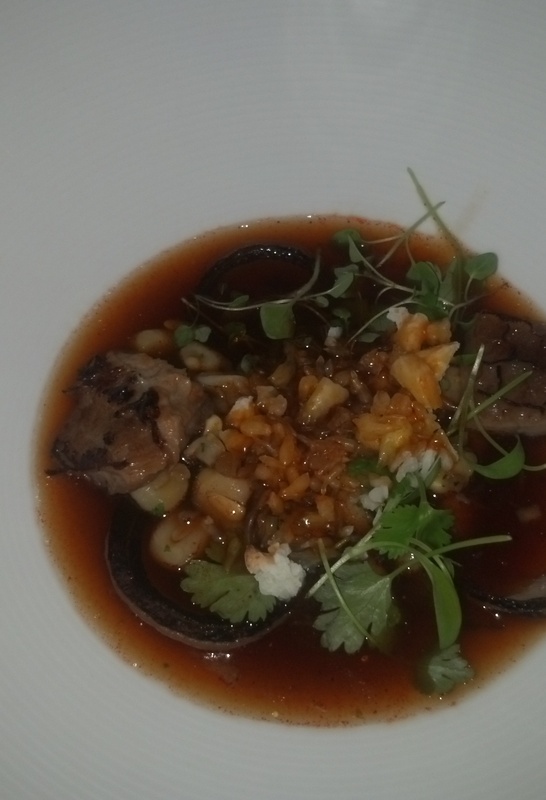 The next course was duck with eggplant chips. The humus was simple puree of chickpeas and olive oil and simply delicious. Beef was up next with a pampered cow from Monroe, Louisiana giving up its life so that we could truly live. The tenderness was comparable to Kobe beef. 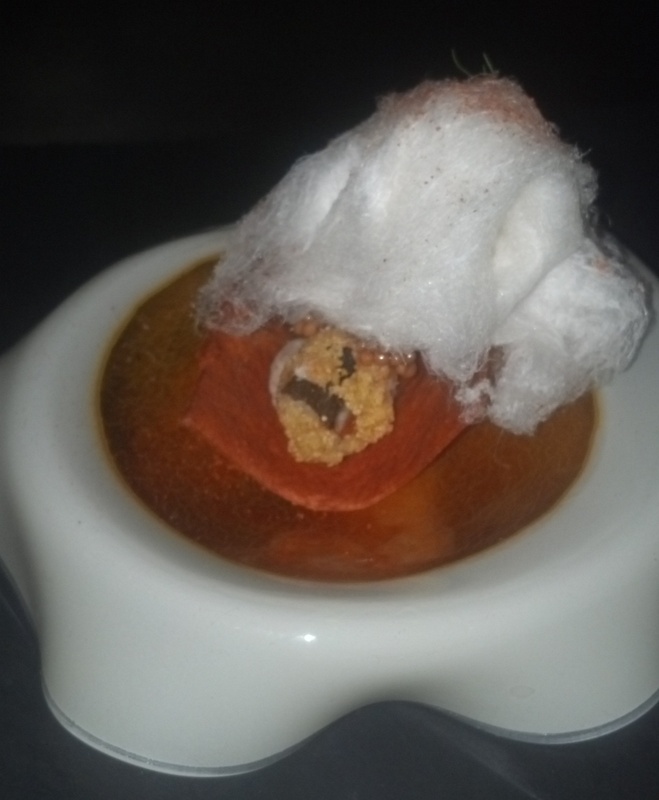 There was a Japanese flair to this dish with a bit of sake and bone marrow foam. It came with its own salad and, again, I ate every bit. 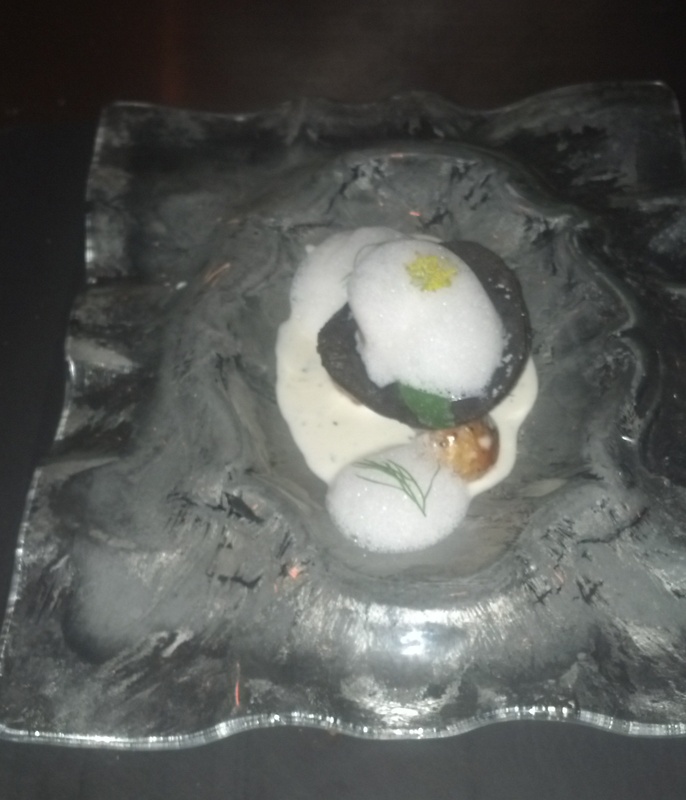 It was served on a wood plate made from a special Japanese wood that also decorated the restaurant. 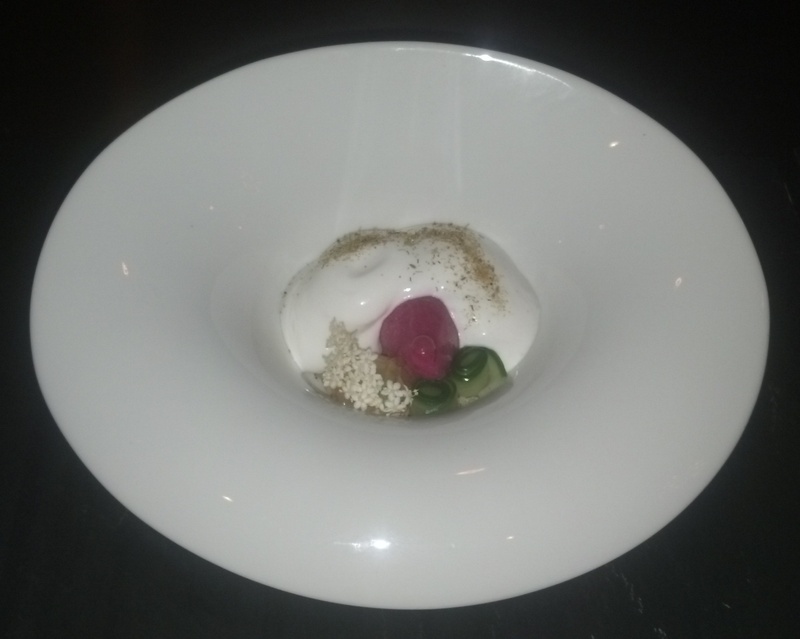 The next dish was a palate cleanser with dill yogurt and a delicious sorbet with elder flowers sprinkled on top. I nearly begged for more. The first dessert course was a celebration of fall. 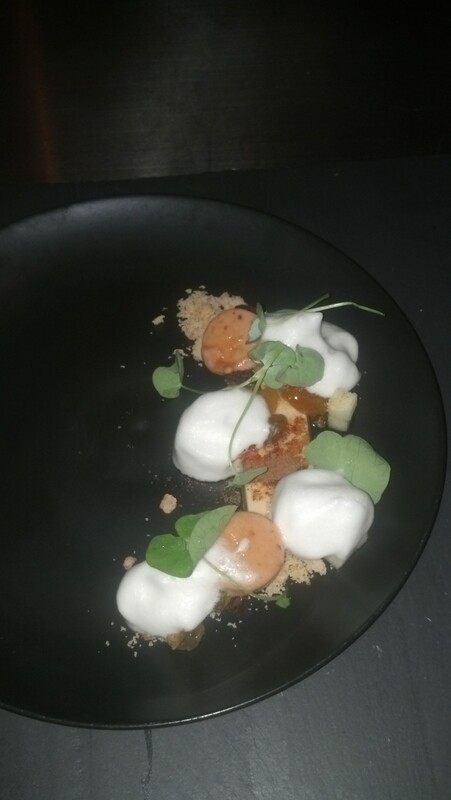 It was apples avant garde with apple cider foam, apple panna cotta, and sunflower leaves. Amazing how light but packed with flavor it was. 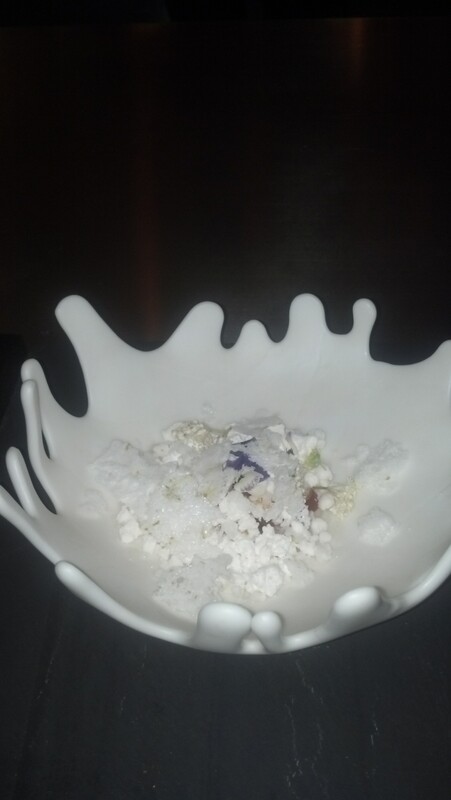 The next dessert was a cold bowl with more culinary magic. There were both sweet and sour flavors with lychee being the focus. I remember being intrigued by the bowl it was presented in until I had my first taste and then I could only focus on getting it all on my spoon. 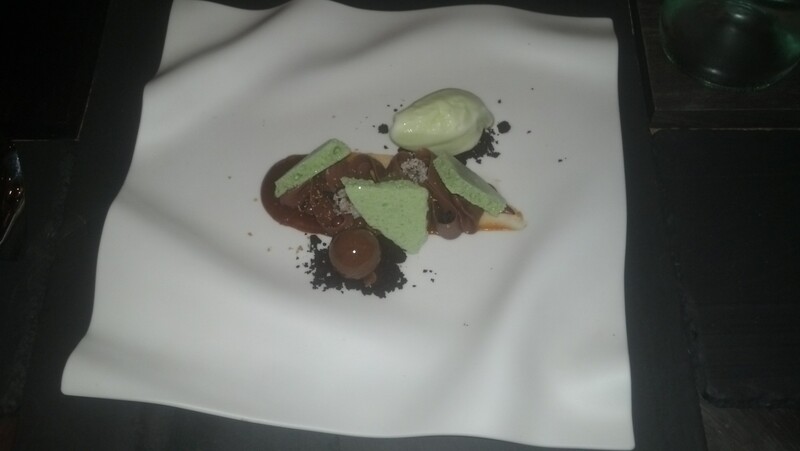 The final dessert was an herbal dessert. The sorbet was tarragon and the meringue just melted in my mouth. I confess to being a little sad when the meal was over. It was a lot of food but spaced out over almost three house, we didn’t feel stuffed. The staff was amazing – they have both wine and cocktail pairings with the meal and the sommelier was very knowledgeable of the grapes and flavor profiles of each wine. They also had a silverware and water Ninja who gave us utensils for each course, moving so silently it was sometimes a surprise to look down and see them there. 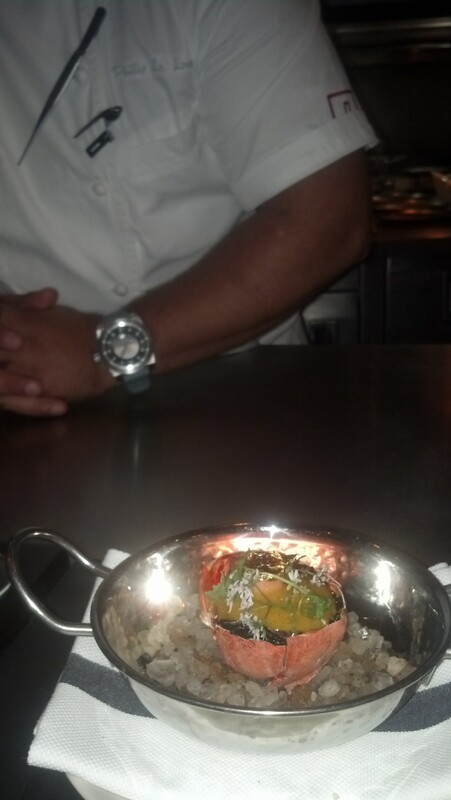 The chef was personable and took the time to explain each dish and the inspiration for them. At the end of the meal, he stopped to chat and to explain that his purpose is for each bite to be unique and mind blowing. He succeeded in spades! While this price fixed meal is a bit expensive (starting at $150 per person and not including the beverages), it was an incredible experience that I will be dreaming about.